OLD ORCHARD BEACH—The Windjammers picked up their first win vs. the Spartans this season at the Ballpark on Sunday afternoon, July 8. 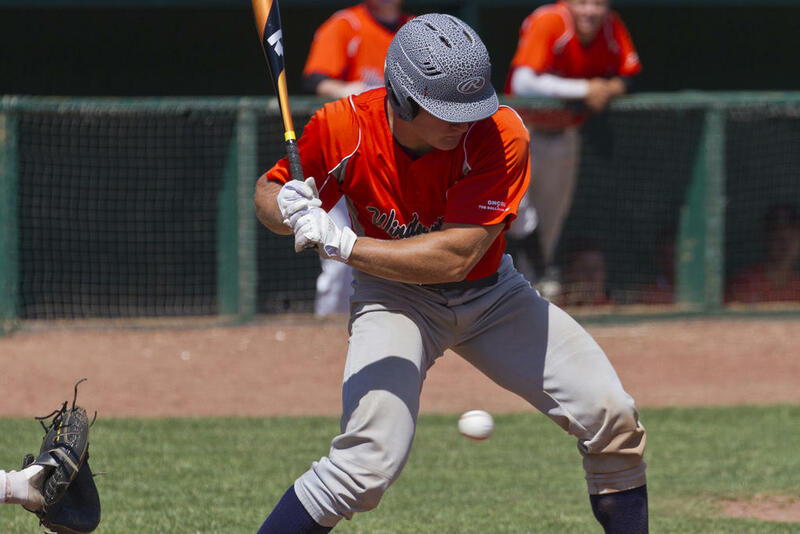 The pair of Greater Northeast Collegiate Baseball League (GNCBL) outfits hung tight with each other until the bottom of the fifth, when Jammers Tucker Banger (Orono/University of Maryland) and Kolby Lambert (Bonny Eagle/Franklin Pierce) drove home a trio of runs, leading to a 6-3 final. The GNCBL’s various teams all comprise players from across Maine and elsewhere in New England; one or two even hail from further abroad. The Spartans feature athletes from Brunswick, Westbrook, Cumberland, Portland, Gorham and beyond, while the Jammers boys come from Hollis, Freeport, Gorham, Saco, Wiscasset and more. Similarly, the players attend colleges scattered (primarily) across the Northeast. 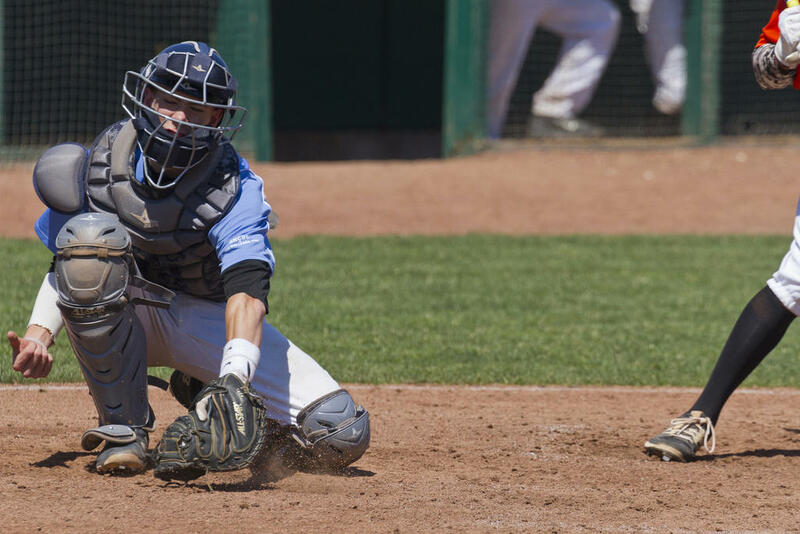 The first inning of Saturday’s matchup unfolded scorelessly: The Spartans loaded the bases in the top of the first – Mattingly Simaan (Mahopac, New York/St. Joseph’s) and Drew Healey (Rochester, New Hampshire/St. Joe’s) both reached scoring position; neither, however, managed to cross home. Likewise, the Jammers stranded Darren Wood (Wiscasset/University of Southern Maine) in their opening at-bats. In the top of the second, though, the Spartans jumped out front 2-0. 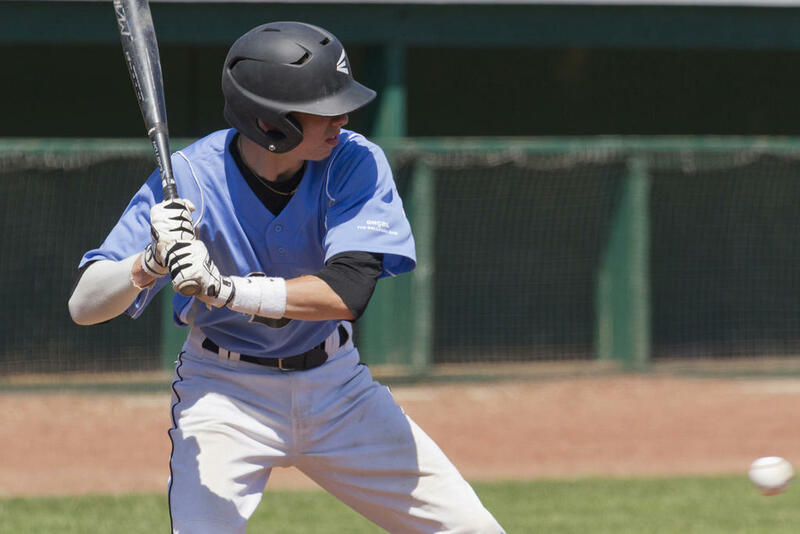 Healey blasted a two-RBI shot, bringing Riley Bartell (Portland/University of Maine Farmington) and Dom Esposito (Westbrook/Thomas) home again. Soon enough, the Jammers reversed their fortunes. Amos Herrin (Wilton/Southern Maine Community College) led things off with a pretty triple to deep left-center, and Kolby Lambert (Bonny Eagle/Franklin Pierce) sac-grounded to bring Herrin home. Brogan Searles-Belanger (Thornton Academy/University of Maine Orono) reached base on a third strike that eluded the grasp of Spartans catcher Jason Komulainen (Gorham/USM) and Wood followed him with a single into shallow center. 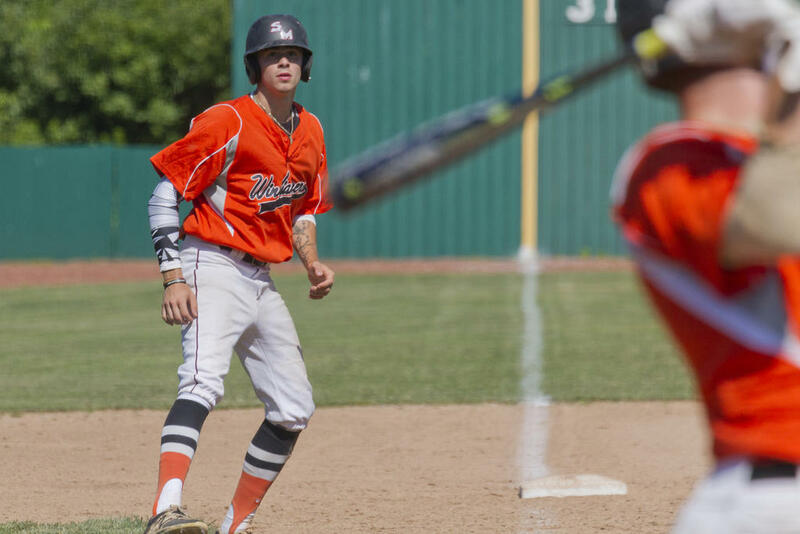 Both scored – and the score suddenly flipped in their team’s favor, 3-2 – when Grant Heffler (Wiscasset/Wheaton) volleyed a single to deep center. 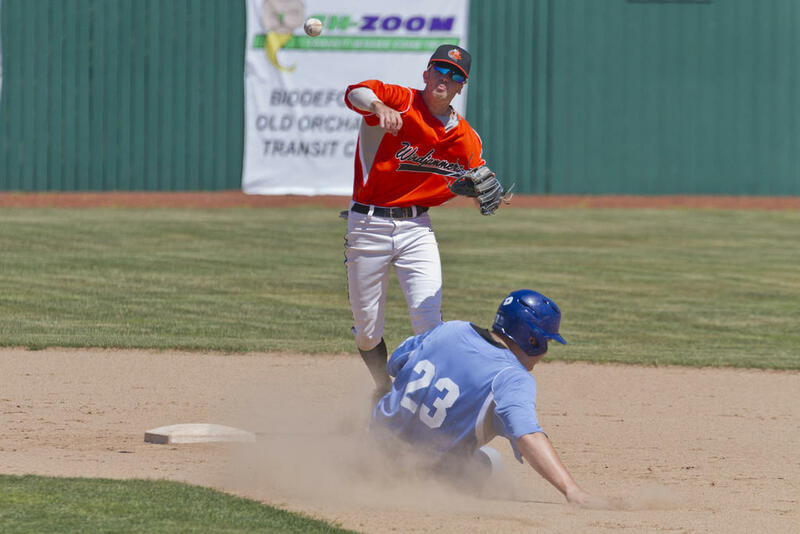 “And then we just had some guys in the middle of our order come up with big hits in timely situations,” Dahms added. 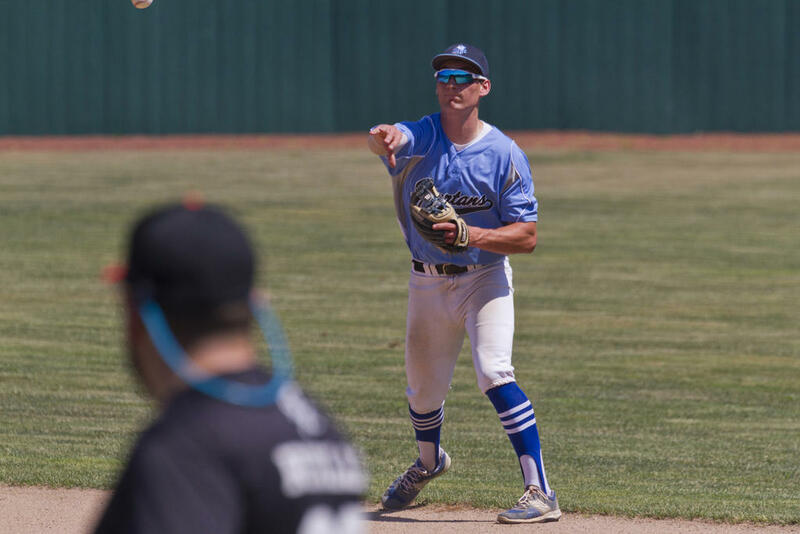 The Spartans tied things up in the top of the fourth – Connor McGuire (Ellsworth/Husson) reached second on an error at third, then rounded to home when Healey grounded into center – but the Jammers followed them with a big bottom of the fifth to pull ahead for good. Banger drove in two, including Justin Copetta (Westbrook/Assumption), with a single to left center, and Lambert brought home Banger with a grounder past short. 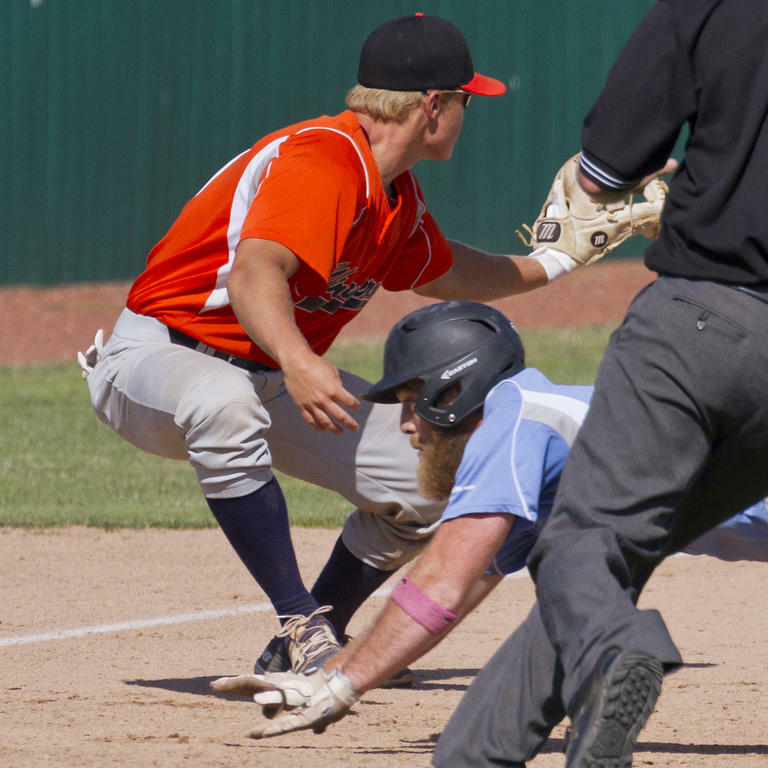 The Jammers owe the victory to timely hitting, of course, but also to reliable defense. Indeed, the team turned two double-plays in the contest: a 4-6-3 in the fourth and a 6-4-3 to close out the action. 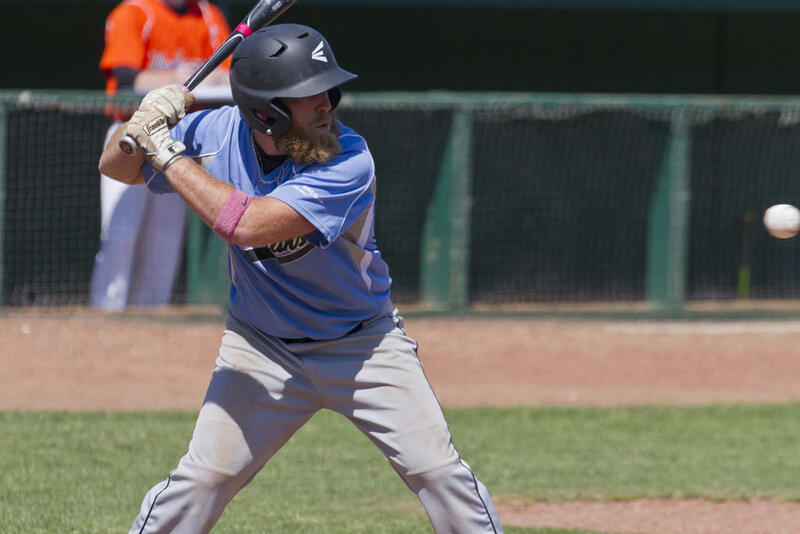 The Jammers are a new squad in the GNCBL; the League launched last summer with four teams (besides the Spartans, there are the Nor’easters, the Norseman and the Patriots), and generated enough interest and success to warrant expanding this year. 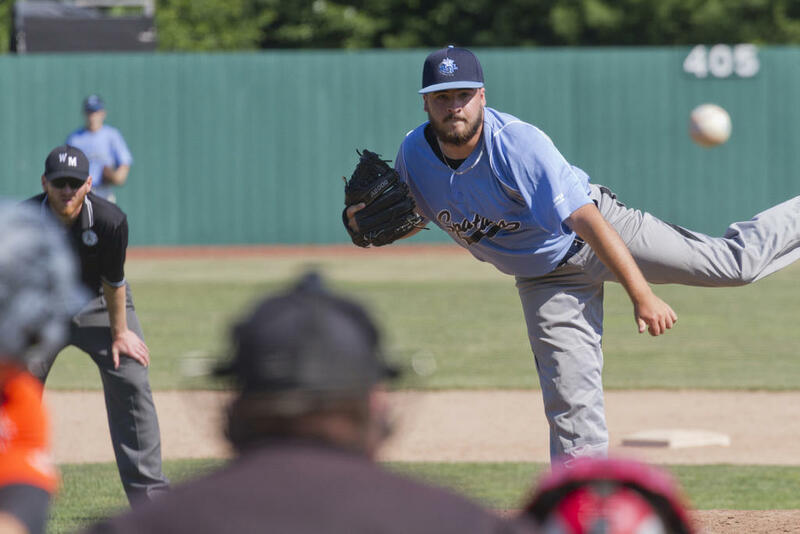 The GNCBL holds bouts not just at the Ballpark, but also at Wainwright Sports Complex in South Portland, at Southern Maine Community College in South Portland, at St. Joseph’s College in Standish and at the University of Southern Maine in Gorham. 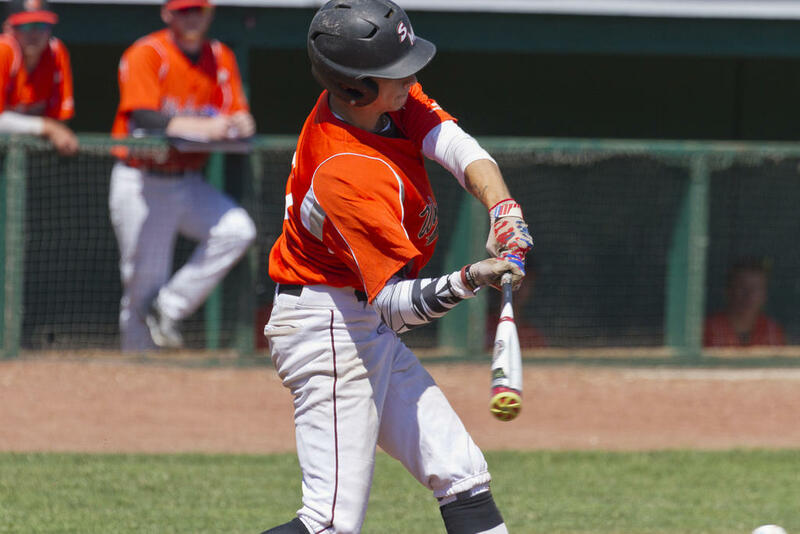 The League plays on Sundays, Tuesdays and Thursdays – a full schedule is available online at www.gncbl.net – and can be tracked down on Facebook at https://www.facebook.com/gncblBaseball/ and Twitter at @GNCBLBaseball. Jammers third-baseman Daren Wood (Wiscasset/USM) waits on an incoming throw as Spartan Dom Esposito (Westbrook/Thomas) dives for the bag. Kolby Lambert (Bonny Eagle/Franklin Pierce) leads off third, hoping for a chance to race home. 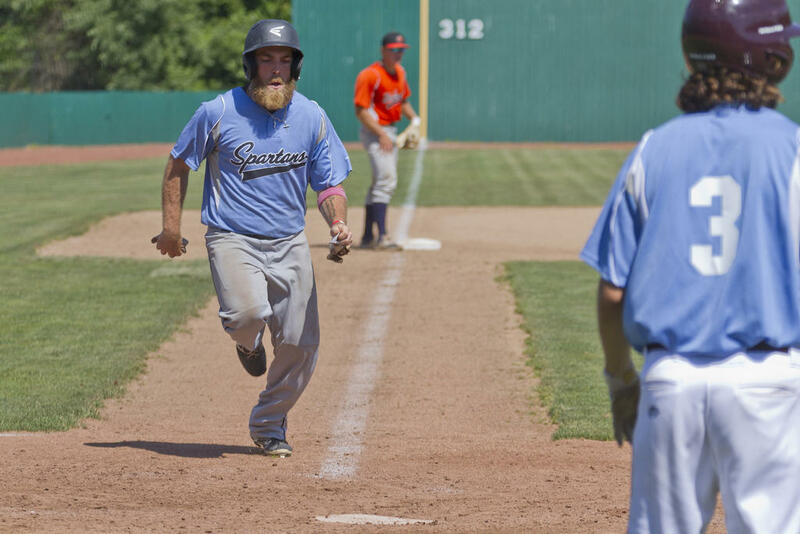 Spartan Dom Esposito (Westbrook/Thomas) arrives home in his team’s loss to the Windjammers on Sunday. The Spartans’ Dom Esposito (Westbrook/Thomas) takes a turn at the plate. Jammers second-basemen Justin Copetta (Westbrook/Assumption) whips the ball toward first, hoping to complete a double-play. The Jammers’ Daren Wood (Wiscasset/USM) watches a low pitch sail past. 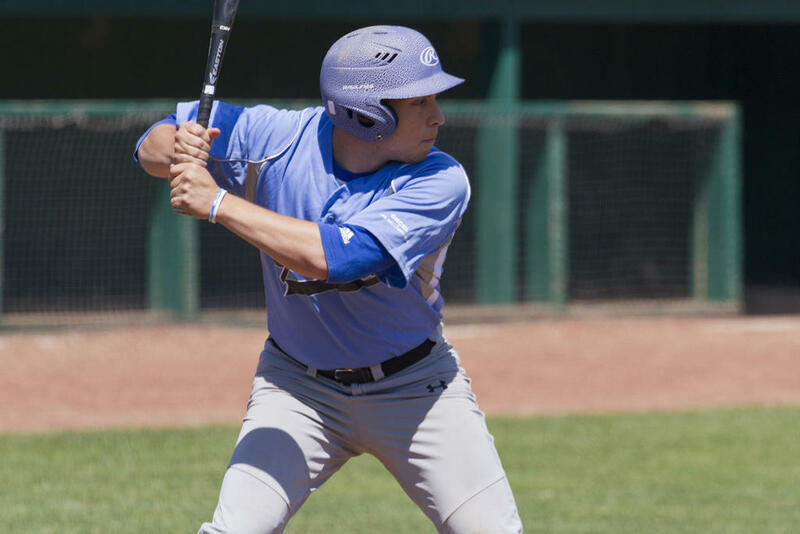 Spartans second-baseman Drew Healey (Rochester, New Hampshire/St. Joe’s) fires a fielded ball toward first for an out against the Windjammers. Jason Komulainein (Gorham/USM) – the Spartans’ catcher through the first half of their loss to the Windjammers – pivots toward a wide pitch. Windjammer Kolby Lambert (Bonny Eagle/Franklin Pierce) takes a cut at an incoming pitch. An pitch sails close to Spartan Jason Komulainen (Gorham/USM). Spartan Mattingly Simaan (Mahopac, New York/St. Joe’s) vies in the batter’s box. The Spartans’ Sam Cloutier (Greely/Bridgton Academy/Keene St.) fires off a pitch.